Free flow is usually observed when the vehicle density in traffic is small enough. The flow rate increases in free flow with increase in vehicle density, whereas the average vehicle speed is a decreasing density function. Congested traffic is defined as a state of traffic in which the average speed is lower than the minimum average speed that is possible in free flow. 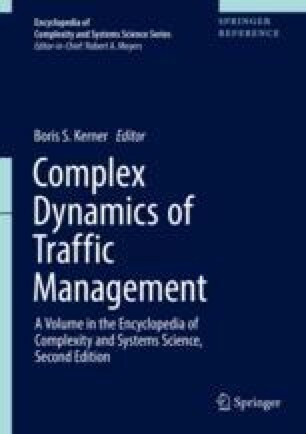 In empirical observations, congested traffic occurs mostly due to traffic breakdown leading to the onset of congestion at a road bottleneck. During traffic breakdown, the average speed decreases sharply in an initial free flow to a lower speed at the bottleneck. In highway traffic, traffic breakdown is associated with a local phase transition from free flow to synchronized flow (F→S transition). The bottleneck can be a result of roadworks, on- and off-ramps, a decrease in the number of freeway lanes, road curves and road gradients, bad weather conditions, accidents, etc. I would like to thank Sergey Klenov for the help and useful suggestions. We thank our partners for their support in the project “MEC-View – Object detection for automated driving based on Mobile Edge Computing,” funded by the German Federal Ministry of Economic Affairs and Energy.